“Fearless” Freddie Banks, Years: 1983 to 1987, Career highlights: Former Valley High star ranks No. 4 with 2,007 career points, tied for fourth in steals (184) and ranks sixth in assists (497). ■ Former Valley High star ranks No. 4 with 2,007 career points, tied for fourth in steals (184) and ranks sixth in assists (497). ■ Played on four NCAA Tournament teams that went 127-17 overall. ■ Made NCAA Tournament-record 10 3-pointers in a Final Four loss to Indiana in 1987. Currently: Assistant coach and campus security monitor at Canyon Springs High School. He and wife Nieda have four sons (Wesley, Freddie Jr., Brandon, Darington) and three daughters (Sidney, Vashonda, Courtney). Selected by Detroit in second round of 1987 NBA Draft. Played six seasons as a pro in CBA and Greece. 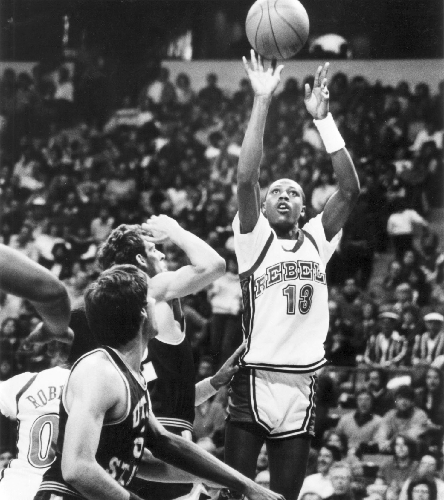 The Review-Journal counts down the top 100 players in UNLV basketball history, 20 years after the Rebels’ NCAA championship season in 1989-90.